"Where do we get such men? They leave this ship and they do their job. Then they must find this speck lost somewhere on the sea. When they find it, they have to land on its pitching deck. Where do we get such men?" I had never seen The Bridges Of Toko-Ri before being asked to review it, although I've known people who liked the original novel by James Michener. In the end, I was very surprised by many things in this film that seemed to totally push aside the expected pitfalls of a war film made in the 1950s. At the heart of all war is the element of tragedy, and Bridges of Toko-Ri is perhaps the one war film to present that tragedy in such a concise and well-crafted manner, and without much fanfare. William Holden portrays Harry Brubaker, a talented, Navy bomber pilot who is heavily involved with missions during the Korean War (which had only just ended as this film hit theaters). Though he does his job well and without complaint, he is also quietly bitter over the fact that he was called up from reserve status, despite having fought in World War II. The admiral of his carrier, George Tarrant (Fredric March), knows he's disappointed, but tries to convince him that his help is definitely needed. So, Tarrant assigns Brubaker to part of a mission that will involve bombing several bridges in Toko-Ri, Korea; among the most dangerous and heavily fortified Communist posts. Before that, however, he gets some time off with his wife, Nancy (Grace Kelly) and his children. During this brief rendezvous in Tokyo, both Harry and Nancy learn a few things about themselves and their attitudes towards the war. They both try to accept the situation and the very real, but grim, possibility that Harry might not come back alive. As the story progresses, Bridges of Toko-Ri becomes an examination of war's 'everyman.' The one who must leave behind a loved one and a family to perform a duty that may seem unpleasant. It's a tribute to veterans of all sorts, in a way, especially those who have died in the line of fire. What may sound a bit like pro-war propaganda, though, is actually a far better structured piece than something that encourages blind loyalty to the military. One of things that struck me was the serious and professional tone of the film; it is without any ridiculous elements of humor or lightheartedness. Mickey Rooney's character (a hot-headed rescue-copter pilot always getting into fights) adds a bit of levity, but not enough to break the mood. The moments of tragedy and sadness in the film aren't turned around into something good, either; indeed, the 'Hollywood hero' syndrome is absent. There are some dated elements, to be sure. The romance between Holden and Kelly is a bit on the melodramatic side, and there's some awkward moments that fall a bit flat by today's standards of dialogue and development, but this is all par for the course with a project of this age. On a technical level, Toko-Ri achieves some greatness as well. Despite heavy use of rear-projected backgrounds, it still manages to create a convincing atmosphere of taking place (mostly) on an aircraft carrier, including loads of authentic footage of real flights and landings. The bombing sequences are dazzling, using fantastic miniature and process photography work, easily some of the most intense action sequences from this time period. Of course, this technique of tight editing and careful effects usage would benefit director Mark Robson later on with Von Ryan's Express. While the film's central message of paying tribute to those who sacrifice for a greater goal is very powerful, I think the one flaw was placing the events during the Korean War. Even at the time, the Korean War was a fairly controversial conflict, and one that many people just never saw much point to, similar to Vietnam. So, the message does bring up questions like, "Was it even worth it to waste men's lives in this war?" This made the movie just a bit harder to swallow for me, personally, but it can be dismissed for the bigger picture. Image Transfer Review: Presented in full-frame (the film was originally 1:37:1), looks very nice, despite some heavy grain and damage on certain sections of the prints. Much of the movie is extremely sharp and clean, with very good balance between accurate colors and sharp black level. Some shots exhibit movement in the backgrounds, but this seems to be more a problem with the source rather than the transfer, which is amazingly free of major compression issues. Audio Transfer Review: Presented in mono, the audio certainly does its job without any major complaints. It's loud and active, but never harsh or distorted. There's a good amount of spatiality, despite being just a center channel mix, and everything comes across with fine detail. The film might have benefitted from a new stereo mix, but as it stands, this track is pleasing for what it is. Extras Review: There is an original trailer and subtitles, but nothing else. The film seems to ask for more in the extras department, so fans might be a little let down. It also could have used a few more chapter stops. 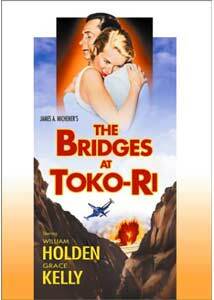 The Bridges Of Toko-Ri is another great war film to see release this Memorial Day season. A first rate cast and solid direction make it a very entertaining, if not tragic, experience.